What Can You Do with an Associate Degree in Health Studies? Whether you want to work directly with patients or mix medicine, an associate degree in Health Studies can move you towards a career. Medical coder. A medical coder analyzes patient health information for doctors’ offices, hospitals and healthcare companies. A coder reviews patient records and organizes the information according to the International Classification of Diseases (ICD). A medical coder also works to ensure the security of patient information, so any interest you might have in organization and safety is a big plus. Medical assistant. “For students interested in working directly with patients, a career as a medical assistant could be a great choice,” says Cheryl McInerney, MSN, RN-BC, and dean of Nursing and Health Sciences at Bay State College. Medical assistants may perform healthcare tasks, including measuring vital signs, preparing patient samples for testing, and helping administer patient examinations. They also often have office responsibilities, such as recording and entering patient data and helping with insurance and patient appointments. And the job market for medical assistants is particularly strong, with jobs predicted to increase 29% over the next 10 years! Community health worker. “Some students want to help people but do not necessarily want to work in a clinical setting,” McInerney says. “For them, a Health Studies degree can lead to work in the community.” Many options exist in community organizations, including health navigators, community health advisors, outreach workers and more. If you’re interested in working with people and bringing health information to your community, this could be a great option. Move on to healthcare management. 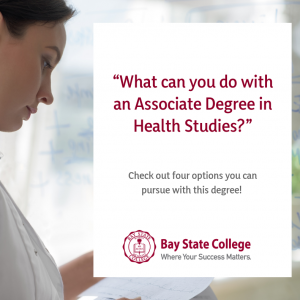 One of the strengths of Bay State College’s Associate Degree in Health Studies is its seamless transition to the college’s Bachelor’s Degree in Healthcare Management. By continuing on, students have the opportunity to get higher level jobs in healthcare, or even continue on to an MBA through Bay State’s partnership with the New England College of Business! 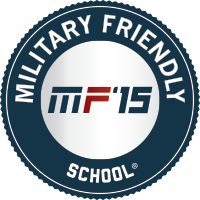 How much does an evening class cost?